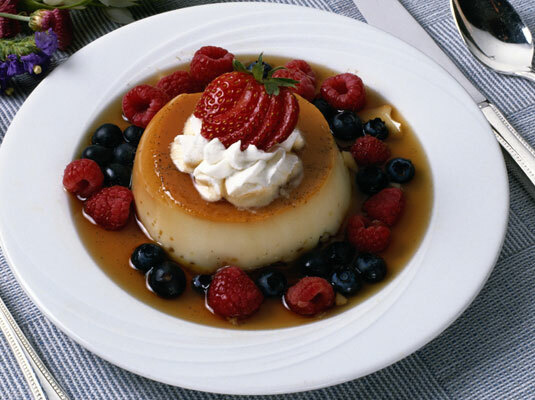 Most Mexican restaurants offer flan, a classic caramel-flavored, sweet and silky vanilla custard. The perfect make-in-advance dessert, flan is a soothing custard finale to spicy foods, and, as an added bonus, it keeps for a few days in the refrigerator without losing freshness or flavor. Combine the sugar and 1/2 cup of the water in a medium saucepan. Cook over moderate heat, swirling the pan occasionally, until the color is dark brown and the mixture has a distinctive fragrance of caramel, about 15 minutes. Use a pastry brush dipped in cold water to wash down any sugar granules from the pot’s sides. Pour enough of the hot caramel into a 9-inch round cake pan to coat the bottom and sides. Slowly and carefully add the remaining 3/4 cup water to the caramel in the saucepan. Bring to a boil and cook over moderate heat until the caramel dissolves, about 5 minutes. Occasionally stir and brush down the sides with the pastry brush dipped in cold water to prevent crystallization. Set this caramel sauce aside to cool and then chill until serving time. Separate 6 of the eggs. In a large mixing bowl, gently whisk together the 6 whole eggs, separated yolks, sweetened condensed milk, and vanilla extract. Avoid incorporating air, which happens when you whisk briskly. Pour the milk and half-and-half into a medium saucepan. Split the vanilla bean lengthwise and, using the tip of a paring knife, scrape the black seeds into the milk. Add the bean and bring the milk to a boil. Gradually pour the hot milk into the egg mixture, whisking constantly. Pass the milk and egg mixture through a strainer into the caramel-coated cake pan. Place the cake pan inside a large roasting pan and carefully pour hot tap water in the larger pan until it reaches halfway up the sides of the flan pan. Bake for 1 hour and 10 minutes, until the center just feels firm when pressed with a finger. Set aside to cool in the pan of water. Remove from the water bath, cover with plastic wrap, and refrigerate at least 4 hours or overnight. Run a knife along the inside edge of the pan and gently press the center of the bottom to loosen. Cover the pan with a platter, invert, and lift the pan off the flan. Cut the flan in wedges and serve topped with cold caramel sauce.